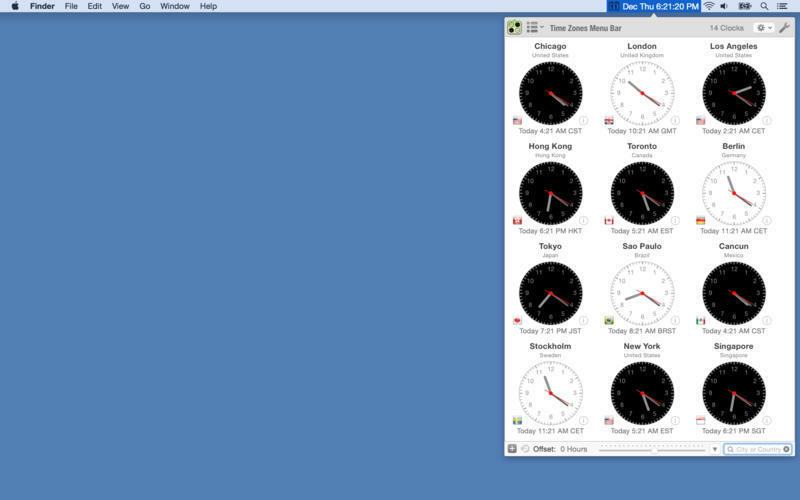 Display multiple time zones in your menu bar. Is there a better alternative to Time Zones Menu Bar? 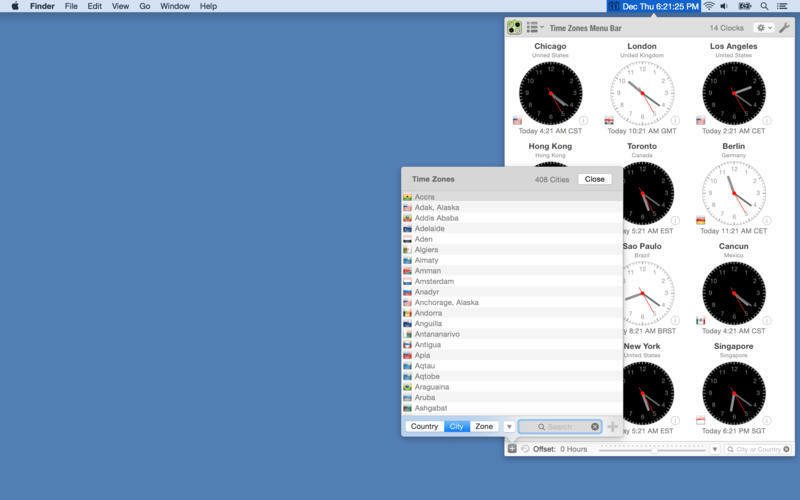 Is Time Zones Menu Bar really the best app in Productivity category? Will Time Zones Menu Bar work good on macOS 10.13.4? Time Zone Menu Bar helps you to track current time and time zone information for multiple cities, because no matter how much you travel, keeping track of the time zones can be a real problem. Display over 400 Times Zones Clocks then search by city or country to find exactly what Time Zones Clocks you want to view. Time Zone Menu Bar also includes a customizable menu bar clock that can be coloured and customized to your personal time displaying needs. Shows month, date, and time in menu bar. 11 custom features to change the date and time display. Time Zones Menu Bar needs a review. Be the first to review this app and get the discussion started! Time Zones Menu Bar needs a rating. Be the first to rate this app and get the discussion started! Add color to your menu bar by changing the color of the date icon or time display. Menu bar or Time Zone Clocks can display 12 hours or 24 hours time formats. Accurate local time zones for a large selection of cities around the world with flag icons. Search over 400 time zones stored by country, city, or time zone. Automatic Daylight-Saving (DST) adjustment based on the current year. Customize the clock display name or adjust the time zone plus or minus one hour. Use the clock offset to easily find the time up to 12 hours behind or ahead of the current time (What time is 6 hours from now?). 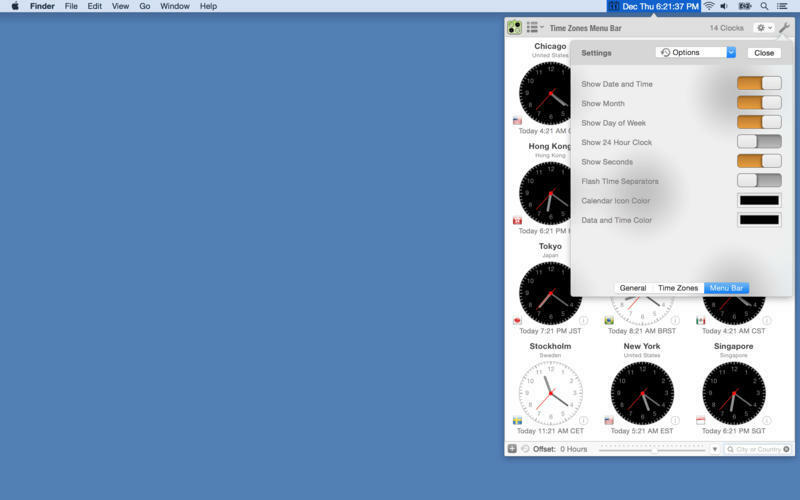 Drag-and-drop any Time Zone Clock to change the order or drag a time zone out of the main view to delete the clock. Easily customize the number Time Zone Clock you want to display in the scrollable collection view (3, 6, or 12 Clocks). Night time clock option to distinguished if its 6 P.M. - 6 A.M. black and white for 6 A.M. - 6 P.M. Smooth second hand movement for Time Zone Clocks. Digital clock and analog clock views.